Dr. J.P. Michaud is a native of Goffstown, NH, graduating from Goffstown High School in 1987. He received his BS degree in Sports Biology from Springfield College in 1991. 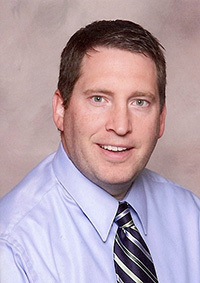 Dr. Michaud graduated from the Illinois College of Optometry in 1996, where he was a member of the Beta Sigma Kappa Optometric Honor Society and president of the student association. He is currently in private practice at Main Street Eye Care at 24 Main St. in Goffstown, NH. Dr. Michaud is a member of the American Optometric Association and the NH Optometric Association. He has a wife, Amy, and 2 daughters. We welcome Dr. JP's wife, Amy, to our practice. Dr. Amy Michaud is also a member of the American Optometric Association and the NH Optometric Association. She will be a valuable addition. Maureen is our Optometric Assistant and Opthalmic Dispenser. She is registered in the State of New Hampshire, and a member of the New Hampshire Optician's Society and New Hampshire ParaOptometric Association. Maureen will assist you in choosing the most appealing eyewear to fit your needs (and your pocket!) She is our eyeglass repair "GURU". She has seldom found a pair of glasses she couldn't fix. Maureen welcomes challenges and faces them head on to give you the best possible service. Amy is our front desk receptionist. She will welcome you to our office, greet you with a smile, set up your appointments and assist you before and after your visit with the doctor. Donna is our bookkeeper and insurance specialist. She has been behind the scenes and maximizing your insurance benefits for 30 years.